In “The Gambler,” country music singer Kenny Rogers croons that “The best you can hope for is to die in your sleep”– presumably suggesting that dying unexpectedly and without enduring long-term suffering is the best way to die. However, most of us won’t be so fortunate. Unarguably, we are living longer thanks to advances in modern medicine. One large area of injury is “sudden onset,” resulting for example from accidents, heart attacks and infections. Treatment is immediate and recovery usually follows within a predictable time. But a significant other patient population, often comprising our steadily increasing elderly population, struggles to cope with a variety of chronic conditions such as heart disease, diabetes and asthma (to name only three) that involve long-term suffering, frequent hospital visits and sometimes premature death. 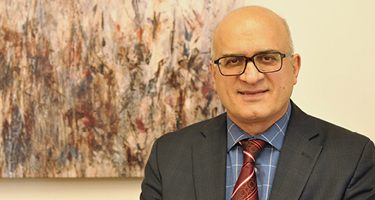 “Chronic diseases are the leading cause of death in Canada and approximately 89% of us will ultimately pass away because of a chronic illness,” says cardiologist Dr. Haissam Haddad, Provincial Head of Medicine for the Saskatchewan Health Authority and the College of Medicine, University of Saskatchewan. In our province, about 257,000 residents or 23% of the population are living with at least one of five major chronic diseases, namely asthma, chronic obstructive pulmonary disease, diabetes, ischemic heart disease and heart failure. Roughly one-quarter of these individuals are living with two or more of the chronic conditions, and almost 1,000 are living with all five at the same time. As he prepares to meet a new chronic-condition patient, Dr. Haddad is keenly interested in learning whether the patient may also be coping with other chronic illness. Not surprisingly, he immediately learns she is being treated and taking medication for one or more other chronic conditions. To this end, one of the exciting new initiatives that Dr. Haddad is proposing is a pilot “Cardio-Oncology Clinic” at Royal University Hospital that will take a multi-disciplinary team approach in navigating the often complicated interplay between cancer and illnesses of the heart. “Having cancer and successfully being treated for it doesn’t mean the risks related to other conditions go away,” explains Dr. Haddad. Development of a new Cardio-Oncology Clinic is one of 12 chronic care initiatives for which RUH Foundation is raising $1.8 million, aiming to enhance the quality of care and programming available at Royal University Hospital and in the community for those living with chronic conditions. Your donation will also support other initiatives related to diabetes, cardiac, stroke, cancer, cystic fibrosis, epilepsy and more as proposed by RUH clinicians and researchers. “With the support of the Foundation and its donors, we will be able to move forward with innovative research, new comprehensive assessment and lifestyle programs, and equipment that will have a positive impact on so many in our community and province living with chronic diseases,” says Dr. Haddad. Donate online, or call Lisa Sands, Chief Development Officer, at 306.655.6477.